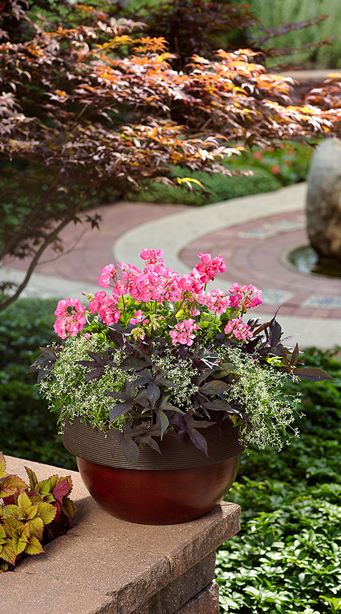 How to design container gardens. Utilizing structure to create the best design possible. Once you've thought about color, which was discussed in Container Garden Design - Color, it is time to start designing how to put together your container. There are several ways to begin designing containers. For patio pots, one common way to start designing is to use the thriller, filler, spiller concept. This concept utilizes three different types of plants to create well-rounded combinations. Thrillers are plants with height that add drama and a vertical element to the combinations. Thrillers can either be flowering or foliage plants. Some examples of thrillers are: coleus, spikes, tall ornamental grasses, Butterfly argyranthemum, gaura and Angelface® angelonia. Thrillers are generally put either in the center or at the back of a container. If a container will be viewed from one side you will generally place the thriller in the back of the pot and if it will be viewed from all sides you want to place the thriller in the center of a container. The photo below is of the recipe Anything Goes and uses Daredevil® Rosita as a center thriller. Once you've chosen your thriller, next start choosing your fillers. Fillers tend to be more rounded or mounded plants. These plants fill in the middle ground of the combination. They are essential for making the planters look full and more than one filler may be used. Fillers are generally placed in front of or around the thriller. Fillers should be placed midway between the edge of the pot and the thriller. If the thriller is in the center of the pot, the fillers should surround the thriller. Some examples of fillers include: Diamond Frost® Euphorbia, Luscious™ lantana, Nemesia, Diascia, shorter Coleus, Artist® Ageratum, and Flambe® Chrysocephalum. Some thrillers can also be fillers. For instance coleus, can be a thriller or if paired with an even taller plant as the thriller, it can function as a filler. In the Cottage Grove combination above on left, Superbells® Red and Superbells® Dreamsicle are the fillers, in this combination they also function as the spillers. Spillers are trailing plants that hang over the edge of the planter. Spillers are the icing on the cake. Some examples of spillers include: Superbells® Calibrachoa, Supertunia® Petunia, Sweet Potato Vine, Chablis® Lamium and Superbena® Verbena. Spillers are placed close to the edge of the pot. If a pot is going to be viewed from all sides spillers should be placed on all sides. 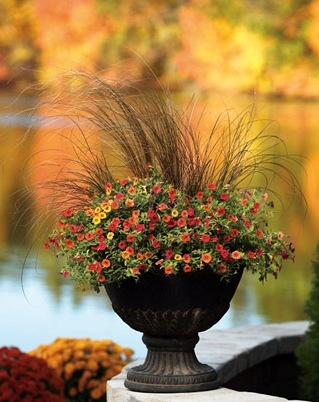 If a planter is going to be viewed only from one side then spillers should be planted at the front of the container. Utilizing the thriller, filler, spiller concept will help you create well-balanced and full upright patio containers. However, it doesn't work for hanging baskets. Thrillers tend to be too tall for hanging baskets. 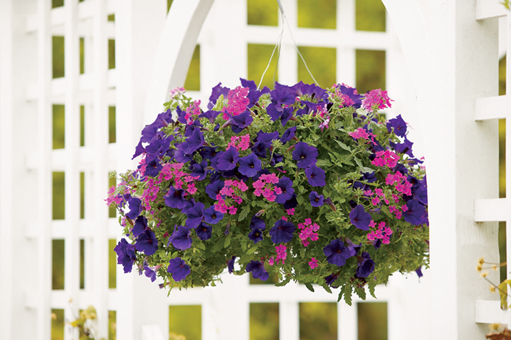 Hanging baskets can be designed using a mixture of spillers and fillers or just spillers. Some spillers will also function as fillers. 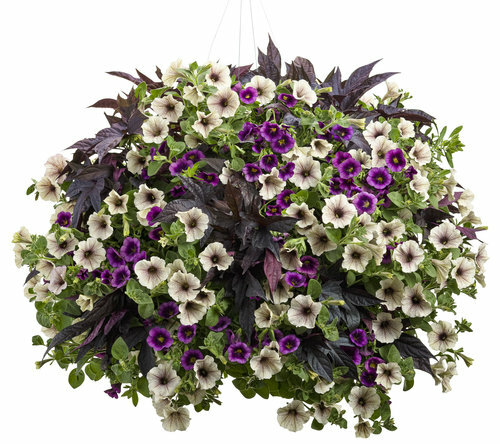 For instance, many Supertunia® Petunias have enough height to function as a filler, but also spill over the edge of the pot - acting as a spiller. Many plants could fit 2 different categories depending on the other plants used in the combination. 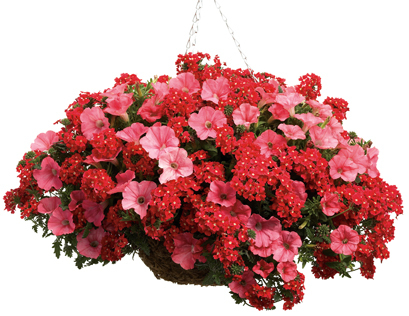 The hanging basket recipes below; Wildfire, Bombay Spice, and Country Morning utilize plants that can function as both fillers and spillers. These plants are an excellent way to make nicely rounded combination baskets. Thriller, filler and spiller is only one of many ways to combine plants. It helps to insure that you get combinations with good height, that are full in the center and have plants that spill over the edge. However, there are many was to combine plants and you should always feel free to play!